The European Union has expanded its anti-Russian sanctions list to 19 more people and nine new entities. The new sanctions contradict common sense and prevent the resolution of the Ukrainian internal conflict, Russia’s Foreign Ministry commented. The newly sanctioned individuals include three top military officials: Deputy Defense Minister Anatoly Antonov, Russia’s First Deputy Defense Minister, Army General Arkady Bakhin, and the head of the main Operation Directorate of General Staff, Lieutenant General Andrey Kartapolov. Two members of the Russian lower house of parliament, the State Duma, singer Iosif Kobzon and Valery Rashkin, who heads the Russian Communist Party branch in Moscow, are also on the list. The remaining 14 people are officials and field commanders of the self-proclaimed republics in eastern Ukraine. The entities added to the sanctions list consist of eight rebel self-defense battalions and the Novorossiya public movement. The EU blacklist now includes 151 citizens of Russia and Ukraine’s self-proclaimed eastern republics and 37 Russian companies and other entities. The updated "blacklist," which was agreed February 9, was published in the EU Official Journal on Monday and came into force at the time of publication. Restrictive measures include the freezing of the individuals’ assets in European Union countries and an EU-wide travel ban. New sanctions defy common sense and prevent a resolution of Ukrainian internal conflict, Russia’s Foreign Ministry commented. Moscow accused Brussels of doing the bidding of Kiev’s ‘party of war’ and noted the irrationality of broadening sanctions against Russia and the rebel authorities at a time when hope had emerged for a peaceful resolution to the Ukrainian crisis. Russia’s representative to the EU, Vladimir Chizhov, told journalists that further extension of sanctions would not promote accomplishment of the Minsk agreements on the Ukrainian crisis. “This will not only give a signal to Russian public opinion and force Russia to return to our own sanctions list, but will dissuade both sides of the conflict from the active implementation of the provisions of the Minsk documents,” Chizhov said. The EU’s expanded sanctions against Russia come after the successful 16-hour Minsk peace talks between the leaders of Russia, Germany, France and Ukraine, aimed at promoting a ceasefire in Ukraine. The Minsk ceasefire agreement envisages a complete end to hostilities in Ukraine, which came into force starting from midnight Sunday, February 15, and remains an effective measure to stop bloodshed in the east of Ukraine, where pro-Kiev regular troops and Ukrainian volunteer battalions are fighting with rebel forces. Regular shelling in the region has left thousands of civilians dead. 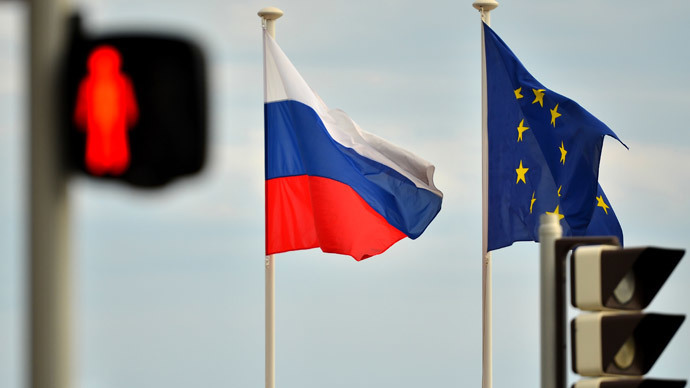 In turn, Russian officials said last week that Moscow will not disclose the names on its blacklist introduced as a reciprocal measure for the new individual sanctions introduced by the EU against Russian citizens. “In the long term, sanctions against Russia endanger Europe’s security of supply,” observed Igor Sechin, CEO of Russia’s energy giant Rosneft, in an article published in the Financial Times on Sunday. There is a lack of unity in the EU over the need for new restrictive measures within the bloc, with the losses suffered by the EU in the “sanctions war” with Russia now put at €21 billion ($24 billion). "Sanctions have had a heavy cost for us all,” said Jose Manuel Garcia-Margallo, the Spanish foreign minister. “In Spain, we have been badly hit in terms of agriculture and tourism," he said.